What does it take to build a digital empire in today’s rapidly evolving media landscape? It takes a powerhouse house of brands that serve up more than 1 billion content views each month to content-hungry audiences. The owner of that house of brands is Vox Media. The company’s eight editorial brands serve up everything from sports coverage on SB Nation to gaming news on Polygon, politics on Vox to the latest shopping trends on Racked. It’s a modern media success story. of new clients, and ongoing management of campaigns. The team selected Asana and soon looked for a way to link it with Salesforce. According to Mike Atwood, Executive Director of Client Success at Vox Media, the company first began by manually re-entering data from Salesforce into Asana. A member of the sales team would add data into Salesforce about an upcoming opportunity and then summarize the data and send it to an email alias for the rest of the team. A member of the revenue support team would then create a new Asana card and copy and paste the opportunity information into this new project. “It was a very inefficient process that lacked transparency across our teams,” says Atwood. “Plus, it added an unnecessary layer of complexity to everyone’s jobs.” Atwood knew that the integration between the two systems needed to be automated so the company quickly chose an off-the-shelf, self-managed integration tool to solve the problem. However, when that tool failed to handle the volume and complexity of Vox Media’s requirements, Atwood had to pursue a better solution. Once the decision was made, the initial integration of the three, disparate systems (Salesforce, Asana and Google Gmail) happened in a matter of weeks. 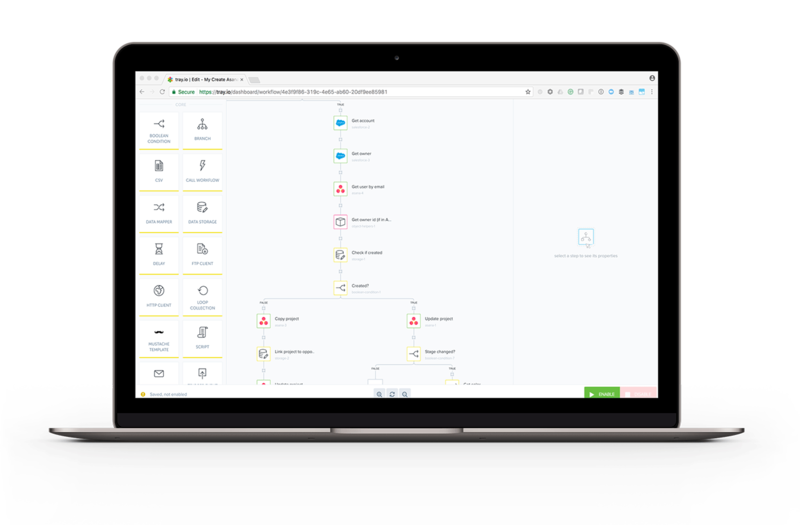 Now Tray is being used to import opportunity data from Salesforce into Asana in real time, a twentyfold reduction in project creation lag time compared to the prior integration vendor. Then Tray automatically assigns users to tasks within the project and assigns due dates, eliminating several duplicative, manual steps to streamline the workflow. To create even greater transparency across teams, Vox Media uses Tray to update status fields in Asana automatically as they are updated in Salesforce. “Before Tray, status information was only available in Salesforce to the sales team,” says Atwood. “If a deal was closed-lost or closed-won, the rest of the team didn’t always get notified.” Now with the Tray integration, everyone on the project is automatically alerted via Gmail when the status changes and the status updates are reflected in Asana. While it’s still early days in the Tray integration of Vox Media’s backend CRM and project management systems, the pre-and post-sales teams are already seeing the benefits. “Tray enables better cross-team collaboration, easier sharing of data in real time, increased integration stability, and transparency across the client lifecycle,” says Atwood. account growth and client retention goals.